Henri Bonneau remains a legend to most Chateauneuf du Pape fans. He was the last of the old timers. The first vintage produced by Henri Bonneau was the 1956. Henri Bonneau was still making wine in the Southern Rhone Valley until he was in his 70’s. His cellars, where he practiced his craft were the most difficult appointment to get in Chateauneuf. They are also the most interesting cellars and caves in the region. Henri Bonneau is old, the estate is even older. Vines were first planted in their vineyards as far back as 1667! Entering the wine cellar of Henri Bonneau is like walking into another world. To enter the home of Mr. Bonneau, which is a modest, multi tiered house, located in the middle of the Chateauneuf du Pape village, across the street from a Church. You pass though the only thing that is close to modern in his house, the Art Nouveau styled door. Keep in mind, Art Nouveau is from the 1920’s! When you walk to the cellars around the back, you pass through a semi-dilapidated, rusty creaking iron gate and make your way down some dangerous looking, broken steps. The floors are so dirty, your shoes stick to the ground as you walk. There was mold and mildew in the cellars current medical science has not yet found names for yet. The youngest barrel in the cellar is at least a decade old. 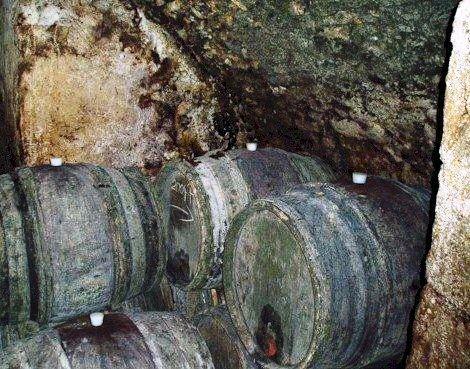 Many of the barrels look as if they are as old as Henri Bonneau is, or even older! Henri Bonneau was born 1938. Rustic does not begin to describe the caves, walls or barrels. Barrels are scattered in a myriad of different small rooms, closet like spaces and tiny caves. The best description I can offer about the caves is they are like a spider web of ancient, decrepit, catacombs. The lighting is accomplished with a few dangling light bulbs on wires, carelessly strung across the low rocky, ceiling. This was the world of Henri Bonneau where some of the best, most sought after Chateauneuf du Pape wines are made. Henri Bonneau came from a long line of winemakers. He was the 12th generation to produce Chateauneuf du Pape. Henri Bonneau was one of the first producers in the appellation to bottle their own wine. That practice started in 1927. Henri Bonneau learned the art of winemaking, the old fashioned way. The skills were passed down from his grandfather to his father, to Henri Bonneau who also passed them to the next generation headed by his son Marcel Bonneau. In fact, Henri Bonneau was the 12th generation of winemakers in his family line. Sadly, in March, 2016, Henri Bonneau passed away at 78 years of age. Following his passing, the son of Henri Bonneau, Marcel Bonneau was placed in charge of the estate. Marcel Bonneau took full control of the winemaking starting with the 2016 vintage. It’s possible that Bonneau has barrels in their cellars that are older than their vines and Henri Bonneau. While most producers in Chateauneuf du Pape feel their best wines come from their oldest, low yielding vines, that is not the case with at Bonneau. Henri Bonneau owns 6.5 hectares of vines spread among 13 different parcel in the Chateauneuf du Pape appellation. Most of his vines, approximately 90% are devoted to Grenache. The remainder of their vineyards are planted to a mix of Mourvedre, Syrah, Vaccarese and Counoise. The vines here are not as old as you might think. 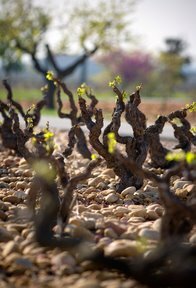 While the average age of their vines is between 30 and 40 years, many of their older vines were only planted in 1964. The majority of vineyards in Chateauneuf du Pape are prized for their old vines, meaning vines that are more than 100 years of age. That is not what takes place at Bonneau, as most vines are replaced by the age of 50. The best terroir of Bonneau are their vines located in the rocky soils found in the La Crau lieu-dit. Bonneau also owns vines in Courthezon. Many Chateauneuf du Pape observers feel Henri Bonneau has the best terroir in the appellation. Much of it sits in the famous La Crau sector. As I mentioned earlier, Henri Bonneau does not have the oldest vines in the appellation by choice. Henri Bonneau feels that after 50 years, a vine is not the same. For that reason, Henri Bonneau does not desire to have the oldest vines in the appellation. On the other hand, Henri Bonneau is often one of the last producers to harvest his grapes each vintage. The berries are only destemmed in moderate or poor vintages, as they probably did not achieve the desired level of phenolic ripeness. To produce the wine of Henri Bonneau, the whole berry cluster fruit goes through alcoholic fermentation in traditional concrete vats. At some point in time, the press wine is blended with the must and ages in a combination of 20 hectoliter foudres, demi muids, and small, crust, moldy looking, oak barrels for 2, 3, 4, 5, 6 years or more! Henri Bonneau is fond of saying the wine is ready when it’s ready. The decision of what juice goes into which wine is not made right away either. It could take years until he decides if a wine is fit to be sold as Celestins, Marie Beurrier or his Henri Bonneau Chateauneuf du Pape. Because of these potential changes, one never knows when, or if any specific wine will be produced or not, or how many bottles can or will be made in any year. It’s important to note that everything changes from vintage to vintage at Henri Bonneau. That is all part of the reason the wines are so good. For some unknown reason, the younger vintages of Henri Bonneau have fallen slightly from its previous mythical status with Chateauneuf du Pape collectors. This is good news because it’s helped keep the prices down to some extent. While the wines are pricey, especially for older vintages which can sell for over $1,5000 in some vintages, due to their unique character and incredible ability to age and evolve for decades, they are worth it. The best vintages of Henri Bonneau are: 2018, 2017, 2016, 2015, 2012, 2010, 2009, 2007, 2006, 2005, 2003, 2001, 2000, 1999, 1998, 1995, 1990, 1989, 1981 and 1978. I have heard from older friends that pre 1978 wines from Henri Bonneau are stunning. But they are impossible to find. In fact, I have never even seen a bottle! Henri Bonneau produces from 4 red Chateauneuf du Pape wines. Henri Bonneau Chateauneuf du Pape – From a blend of 90% Grenache and 10% Mourvedre as well as small portions of Syrah, Counoise, Vaccarese. The grapes are not destemmed, except in moderate or unripe vintages. Vinification takes place in traditional, concrete tanks. The wine is aged in a combination of old foudres and old as well as older French oak barrels for between 3 to 5 years. Every vintage is different and unique. Henri Bonneau Marie Beurrier made its debut with the 1988 vintage. The wine, Marie Beurrier takes its name from an aunt of Henri Bonneau. The blend is made from 90% Grenache and 10% Mourvedre, give or take as small portions of Syrah, Counoise, Vaccarese can also be included, or not. The grapes are not destemmed, except in moderate or unripe vintages. Vinification takes place in traditional, concrete tanks. The wine is aged in a combination of old foudres and old as well as older French oak barrels for between 3 to 5 years. Every vintage is different and unique. Henri Bonneau Reserve des Celestins, the most famous and expensive wine of the domaine made its debut in 1927. The wine is a blend of about 90% Grenache, with varying percentages of Mourvedre, Syrah, Counoise, Vaccarese. The grapes are not destemmed, except in moderate or unripe vintages. Whole cluster vinification takes place in traditional, concrete tanks. The wine is aged in a combination of old foudres and old as well as older French oak barrels for between 3 to 5 years, or even longer in some vintages. Every vintage is different and unique. Bonneau Celestins is a selection of the best barrels that is made in only the top vintages. That explains why Henri Bonneau Reserve des Celestins is not made every year. Henri Bonneau Cuvee Speciale. The Speciale is not produced in most vintages. It is a very ripe, port like wine that is not for everyone. The decision as to what barrels end up in which wines is made shortly before bottling. The choice is made based on quality. So far, Henri Bonneau Cuvee Speciale has only been produced in 1990 and 1998. Henri Bonneau needs time in the cellar before it can truly be appreciated. If you re going to drink the wine young, you can decant for 2-4 hours. This allows the wine to soften and open its perfume. Older vintages might need very little decanting, just enough to remove the sediment. Henri Bonneau is usually better with 4-10 years of bottle age. Of course that can vary slightly, depending on the vintage. In the best vintages the wine should be consumed within 9-35 years after the vintage. Henri Bonneau is best served at 15.5 degrees Celsius, 60 degrees Fahrenheit. The cool, almost cellar temperature gives the wine more freshness and lift. Domaine Henri Bonneau is best served with all types of classic meat dishes, veal, pork, beef, lamb, duck, game, roast chicken, roasted, braised, stewed, and grilled dishes, sausage, cassoulet, eggplant and tomatoes. Domaine Henri Bonneau is also good with Asian dishes, hearty fish courses like tuna, mushrooms, pasta and cheese. Henri Bonneau also makes wine from 3.5 hectares of vines located in the Laval Saint Roman Gard, and a Les Rouliers, a Vin de Table wine, that is made from a blend that is mostly Grenache. Along with Beaucastel Hommage Jacques Perrin, the wine of Henri Bonneau Celestins, has the potential to age and develop for the longest period of time of any wine from the entire Southern Rhone Valley. A more civilized style of Celestins, the wine is incredibly ripe, but not overripe. Round, soft, forward and concentrated, the fruit is clean, spicy, earthy and fresh. Interestingly, at this time, the wine is disarmingly easy to drink with just an hour or 2 of air. Rich, dense, ripe and even over ripe to some degree, there is a lot going here. Intense, sweet, fat juicy, red berries, kirsch, earth, herbs, barnyard and figs on the mouth and palate. There is a touch of heat, but there is such a wealth of fruit here, I suspect everything will come together as it ages. Packed and stacked with incredibly big waves of meaty, peppery, kirsch, herbs, spice and black raspberry liqueur. Thick, dense and palate coating, this tannic, intense wine demands at least a decade and probably more of bottle age before it becomes civilized. Impressive layers of concentrated fruit, with complex aromatics and a great sense of purity of fruit in the rich finish. Time should add more complexity to this meaty wine. Based on the color, you'd swear this was at least 10 or maybe 20 years older than its true age, due to its light hue. On the palate, the wine was fresh, sweet, silky, polished and long. The texture was exotic and you could easily say the same thing about the ripe kirsch on the palate. The nose was complex, the fruit was there, but it was far more advanced than the other high-end 2001 Chateauneuf du Papes opened in the same flight. This sports an herb, spicy kirsch and cherry nose. Good body. Nice entry. Elegant for young Celestins in a good vintage. When tasting together, the owner of this famed Chateauneuf du Pape offered sage advice. "Drink good wine with friends, but drink your great wine with a lover." He has a good idea there, if you ask me. Filled with animal scents, grilled steak, kirsch, earth, fresh cracked pepper and garrigue, this rich, concentrated, deep wine is packed with layers of ripe Grenache with the stuffing and structure to continue to age and evolve. A very fine wine, but it lacks the depth of flavor and ripeness in the fruits and tannins, I was hoping for. Still, it is hard to miss the unique, barnyard, dark red berry, peppery, garrigue character that is found from start to finish. Light ruby, red in color with aromatics of Kirsch, Garrigue and jammy strawberries. Silky entry, but where was the concentration, complexity and character? Where was the beef? The elegant, red fruit finish was nice, but from Celestins, I expect more than nice. Take a bowl of ripe cherries, add some barnyard funk, earth and garrigue, you get an idea about this wines character. On the palate, the wine is soft, inviting and ready for prime time drinking. The nose jumped out of the glass with scents of forests, spices, licorice, coffee, black fruits, pepper and ripe, fresh strawberries purchased from the Farmers Market! Full bodied, good acidity and the 14% alcohol was completely buried. Although I suspect the alcohol was higher. Very ripe fruit. The only way I can describe this wine entering your mouth is picturing biting into ripe plums and savoring the fruit while it remained on your palate! Dark, opaque color. Cherries, earth, pepper, black fruit and herbs explode from the glass. Thick, dense, concentrated, full bodied, beefy and opulent. Black cherries and dark, sweet black fruit on the palate. This has a long life ahead. A unique style of Chateauneuf. Still showing a serious depth of color here, this is an incredibly intense tasting experience. The wine is massive, yet, balanced. Ripe, but not overripe, although there is a sensation of jam on top of all the dark red, peppery fruits. Thick enough to eat, the spicy kirsch, horsey barnyard, garrigue and wet earth really make an impression. Rich and endless on your palate, this is still young. Give it an hour or two of air, or wait another 6-8 years. This is a unique styling of Chateauneuf du Pape that is not repeated in other wines. I was almost speechless from the first sniff and sip! Intense levels of earthy, smoky, black cherries, plum, garrigue, pepper and truffle. Palate coating richness and concentration of raw material that left you tasting layers of ripe and over ripe berries for close to 50 seconds. Still young, this is a legend in the making! This is almost off the charts with its massive, intense levels of concentration! It's hard to fathom how Henri Bonneau managed to stuff so much fruit into a single bottle of wine. Kirsch liqueur, stone, black cherry, licorice, pepper and black raspberry aromatics, waves of intense, ripe, peppery fruit and a long, pure, sensation of cherry port in the finish. Still young, this is going to one of the Chateauneuf du Pape wines people dream about tasting when it his maturity. As for when that's going to happen, your guess is as good as mine. I'm waiting another few years before popping a bottle. Thick, dense and concedntrated, it tasted like a magnum worth of wine was placed inside a 750. However, don’t let it’s size fool you. This is perfectly balanced, concentrated and intense. Just loved this wine! Elegant in texture, the nose, with its perfect blend of earth, barnyard, cherries, licorice, flowers and garrigue really gets your engine going. Fresh, vibrant and earthy, this is drinking at peak. Jammy black cherries, earth, fresh strawberries, fresh black pepper, spice and brown sugar notes open to a ready to drink, traditionally styled, concentrated wine from Henri Bonneau that ends with a long, kirsch filled finish. This seems to be fully mature at this point. Bright cherry and black raspberry with fresh pepper and market herbs in the nose. Good concentration and simlar in style of Celestins, but lacking the body and intensity. Possibly the most unique wine I’ve ever tasted. Never having seen this before, I did not know what to expect. The initial taste and smell popped my eyes out of my head and made me jump back in my chair! This is best described as fermented dinosaur blood. Huge, hulking and massive does not fully express what this wine is. I don't think I'd want to taste this often, but it’s an amazing experience. At 20 years of age, this was the best showing yet. Rich, concentrated and packed with sweet, juicy, dark red fruits, meat, pepper and a touch of VA, (not enough to bother me, but it was there) the wine offers complexity, lushness and length. Popped and poured, this was great from the get go. Full bodied, beefy, spicy, masculine and perhaps a bit stern, there is ample spicy, sweet, peppery, fresh red berries, herbs and soil, along with abundant tannins. More interesting on the nose than the palate. At 20 years of age, this demands at least another 5 years in the bottle. Open and accessible, the medium bodied wine offers fresh, ripe cherries, pepper, kirsch, earth and black raspberries with a long, pure, soft, spicy, red berry filled finish. The tannins seem to have melted away. I was surprised by how fast this had developed. There is no reason to hold any longer. This old school styled Chateauneuf is filled with sappy, cherry, spice, beef, pepper and strawberry jam notes. Still young, I'd give this structured, beefy, tannic Chateauneuf another 5 years before popping another bottle. With a complex nose of black and red cherries, flowers, smoke, meat, garrigue and pepper, the wine is deep, concentrated, rich, long and still youthful. This is molten terroir of Chateauneuf du Pape! The compelling nose of raw meat, pepper, herbs, pre historic cherries and spice was accompanied by an almost overwhelming mouth feel. Huge, yet balanced, this complex wine had a fresh, strawberry, kirsch, spice filled finish that lasted over one minute! Mr. Ed, so this is where you have been hiding. This wine, or at least this bottle shows a lot of barnyard notes. But that does not keep the floral, earthy, smoky, citrus, kirsch and pepper and garrigue from making an appearance. Concentrated, long, deep and intense, this is ready to drink. WOW! Animalistic, wild and yet, silky, robust, fresh and sweet, there is beautiful sense of purity to the sweet, perfectly ripe red fruits and a lush, intense, rich, textural component to the wine that is frankly unequaled. Wow! The nose offers a knock out punch with the perfect combination of ripe and over, black and red cherries kirsch, garrigue, strawberry liqueur and earthy aromatics. Massive, intense and layered with sweet, ripe, spicy fruits, the wine builds in intensity with each sniff, swallow and sip. Dried, wild cherries, pepper, wet, earth and garrigue make sure you know, they are there. On the palate, the wine is concentrated, long, rich and combines wild, ripe, cherries and black raspberry, kirsch, pepper and herbs. Clearly, this is one of the longest, lived vintges of Celestins, as this is developed, but it should remain on the uphill climb for years. Continuing to come on strong, with secondary notes galore of barnyard, earth, garrigue and peppery kirsch. Full bodied, concentrated and long, this is a unique styling of Southern Rhone that needs to be tasted at least once or twice. Having bought a case of this, I've been trying it over the years, waiting for it to fully come around. It has arrived. This distinctive wine takes a basket of fresh picked, extremely ripe cherries and spills it on a wet, sweaty horse before the fruit falls to the bottom of the stable and mixes with barnyard and garrigue scents. Powerful, concentrated and meaty, this is a very animalistic Chateauneuf du Pape with a long, deep, dark red berry finish. Pepper, barnyard, fennel, kirsch and earthy scents open to a powerful, concentrated, meaty, brawny, Chateauneuf du Pape. The rich, robust wine ends with sweet black cherry, black raspberry, spice, herb and pepper sensations. Tossing out scents of cherries, kirsch, raspberries, meat, spices and herbs. Brawny in texture and slightly rustic, it offered layers of fruit on the palate. Beef blood, iron, Kirsch, herbs and earthy scents. Still tannic.Big, beefy, meaty and cConcentrated, structured and rustic. Needs time.